1 November Honor 7A Flash Sale Loot is here. Buy Honor 7A smartphone at Just Rs 1 only. Honor has come up with new loot flash sale. 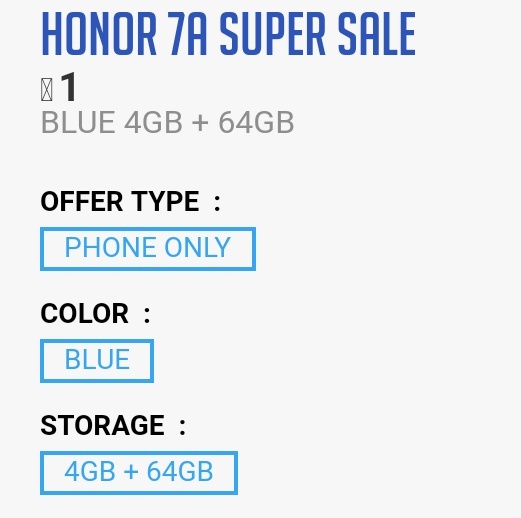 Buy Honor 7A Flash Sale. The price of honor 7A smartphone of Rs 8,999 Only. Sale is live Today on 11:45AM. 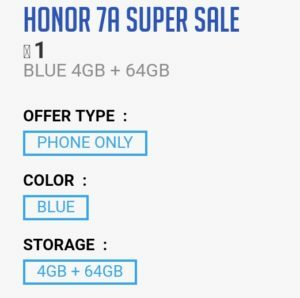 This Offer is available for those users who is registered on honor store. Grab 1 November Honor 7A Flash Sale Loot now. 0.0.1 How To Buy Honor 7A Smartphone at Just Rs 1? How To Buy Honor 7A Smartphone at Just Rs 1? 4) Visit Flash Sale On 1 November, 2018 at 11:45 AM. 7) Pay the amount Rs 1 and complete your transaction. 8) Done !! Your product will be delivered within 30 days. 2) Only registered users can buy the product at the Rush- buy rate. You can not change the product delivery data once the order has been accepted. 4) If the website is abandoned, no previously added information will be recorded and the option to put the product will be lost. 5) Payment: Only when payment has been made and confirmation of purchase has been received,the product will be yours.